The holiday season is traditionally a time to be with family, and for many of us that includes our animals. The Northwest is paws-down one of the most pet-friendly communities in the nation, and many properties offer superlative amenities, great rates, and spectacular services for holiday revelers, and our furry best friends. Spot sniffed out some great accommodations to consider for a holiday getaway this season, in some of our favorite getaway locales. A sense of tranquility grows exponentially with each mile nearer to your destination. Of course any trip to the coast should include the pooch, and coastal towns tend to be uber pet-friendly — the hard part might be choosing your favorite! No cookie-cutter rooms here! Attention to detail shines at this charming little inn. Super pet-friendly, dogs receive their own welcome basket complete with biscuits, beach towel, and blanket. The cozy loft bedroom is ideal for curling up in the dormer window with a great read. Or borrow a bike or kite from the inn and head four blocks for some beachside fun. The tiny town of Gearhart is just a block away, and it’s a quick drive to Seaside or Cannon Beach for more daytime options. $15 per pet per night with a maximum of 2 pets per unit. If you prefer tons of options, contact Horizon Rentals based in Lincoln City. With a generous inventory of pet-friendly vacation rental homes all along the coast, you can be as specific as you like and select from oceanfront, lakefront or mountain view homes, condos or cabins. Horizon Rentals has done the work for you in your version of perfection. Virtual tours of pet-friendly rental homes are just a click away. At the edge of a forest and off the beaten path just a block from the beach, the dog-friendly Idyllic Beach House can accommodate up to nine people. You and your dog will enjoy romping on this secluded stretch of sand where even during summer months you may not encounter another soul. Owner Susy Wolfson has perfected the details in this completely remodeled haven away from home. Here you’ll awake to spectacular views, thanks to vaulted ceilings, numerous skylights and floor-to-ceiling windows. Other amenities include a sizable cedar deck and cheerful patio, roomy kitchen, a fireplace and games and movies galore. Salishan’s breathtaking setting offers the perfect relaxed atmosphere with a cool back-to-nature vibe. The luxury hotel spa and golf resort’s 205 cabin-like rooms are designed for extraordinary comfort, with fireplaces, plush robes, comfy pillowtop beds . . . and a great big welcome mat for the dawg! Select rooms available for pet guests. Be sure to mention he/she will be traveling with you when making your reservation. Cool, crisp mornings, pleasant sunny days — the high desert country of Central Oregon is a delightful place to enjoy a holiday retreat AND adventure with the furry ones! With no shortage of pet-friendly accommodations, Central Oregon is a great place to stay and play with your animals. The Bennington family loves dogs! Their 180+ family-owned dog-friendly vacation rental properties in beautiful Sunriver range from cabins to luxury homes. Dogs are guests too at Bennington Properties, and are greeted by name and given their own welcome package of doggie bowls, treats, bandanas, tennis balls and tags. All guests have access to the off-leash recreation area and complimentary self-service dog wash with grooming amenities. All you need to bring is your dirty dog! Located between Sunriver and LaPine, a stay at one of Diamond Stone’s bed & breakfast or vacation lodge homes are picture-perfect getaways from civilization. The property proves you needn’t go far or pay a lot to recharge your batteries. Radiating a Norman Rockwell feel, Diamond Stone is not your average hotel. Hosts Doug & Gloria Watt let guests unwind with their own unique experience, complete with outdoor beauty, fresh air, family fun, and a little romance. Of course pets are always welcome! This is canine paradise, thanks to thousands of acres of national forest brimming with hiking trails and lakes, over 30 miles of paved walking routes and bike paths, and plenty of wide-open spaces. The biggest and best-known resort in the area, Sunriver has over 70 pet-friendly accommodations in home rentals and lodge guestrooms and suites. Pet rates vary, so check when making reservations. Tell them Tivi sent you! Hiking, waterfalls, windsurfing, photography, wildlife, birding — you can do all this and more during holiday travels through the Gorge. Eighty miles long and up to 4,000 feet deep with the north canyon walls in Washington and south canyon walls in Oregon, the Gorge is simply spectacular. In the heart of the Gorge, this pet-friendly lodging is convenient to almost everything the Northwest has to offer. Select from scenic waterfront or mountain view rooms that are comfortable, clean and affordable with riverfront access and private beaches. This shoreline hotel is an easy, scenic one-hour drive from Portland. Call for pet rates. An historic site with abundant amenities and dog-friendliness make The Dalles Inn an ideal choice whether traveling on holiday, business or pleasure. Accepting dogs of all sizes, canine guests receive a basket of items to make their stay comfy. The Emerald City is a popular travel destination, and numerous attractions and hotels roll out the welcome mats for dogs and cats. Even Seattle’s mass transit system is pet-friendly, allowing well-behaved dogs on street cars and buses. Small dogs that can ride in their owner’s laps are free, while larger dogs pay standard fare. Kimpton hotels offer great pet amenity programs. Both located in downtown Seattle, the Alexis and Monaco both offer the VIP (Very Important Pet) package, which includes a designer doggie bed, food, water and treats. Additional pampering services are available. These luxury hotels pamper their guests, and provide the same care, comfort, flavor and fun to their furry guests as their human companions. Best of all, no additional fees for pets! Just as comfortable but gentler on the budget, La Quinta Inns welcomes pets with open paws, with no pet fees, weight restrictions, or limit on pets per room. The seven-story high-rise in downtown Seattle is walking distance to attractions, and a dog park awaits your pooch right across the street. Every La Quinta Inn offers a free breakfast; there are three additional locations in the Seattle area. Four-legged friends are welcome at all Red Lion Hotels nationwide. Pet fees are waived for Red Lion B&B Club members. Membership is free and yield points for every stay, which can be used for air miles, car rental and shopping. Numerous locations throughout Oregon & Washington. Just 20 minutes from Seattle, this rustic retreat offers loads of civilized comforts for you and your best friend. Both of you will feel pampered and revived after spending the holidays here! Ruthie, official greeter and lodge dog, welcomes every doggy guest personally. Pet amenities include a doggie room service menu and map and directions for pet/pet parent walks on over five acres of beautiful gardens and trails along the river. Many hotels and vacation rentals offer holiday and mid-week discounts. If you’re planning a holiday adventure, call as soon as possible: as policies, rates and availability change frequently. And be sure to ask about pet rates, limitations (some properties limit the number of pets allowed per room), and special amenities or services. There are many wonderful choices, and you should easily find the purrfect thing for you and your faithful co-pilot! 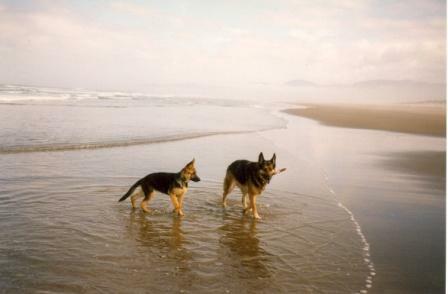 Posted in Pet Biz, Travel/Recreation and tagged with Pet-friendly accommodations, Travel. November 1, 2010 by Vonnie Harris - Spot Magazine.